The owner of hundreds of fish spas nationwide has lashed out at an Australian woman and the foreign media for discrediting Thailand. And to prove that his spas are clean he has plunged his head into a tank of fish normally reserved for tourists’ feet. The actions of Chaiyaporn Lojaya come in the wake of the Aussie’s claims in UK media that she lost her toes due to an infection picked up in Thailand at a fish spa. 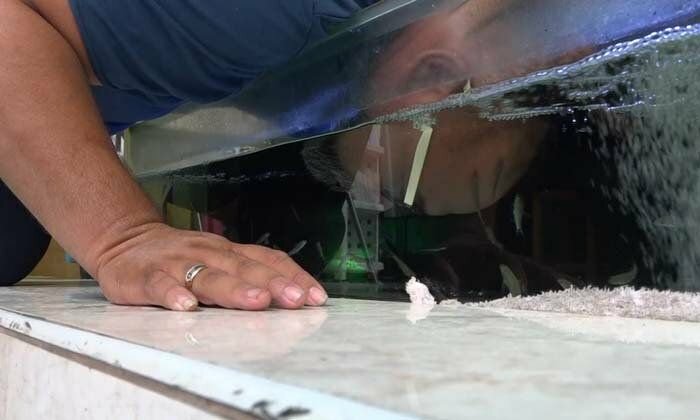 Chaiyaporn – owner of Bangkok Dr Fish Spa 99 that has 300 branches throughout Thailand – was at his Chiang Mai Night Bazaar location for the publicity stunt. He slammed the foreign media and the woman for having a go at Thailand. He claims his spas are sanitary, properly run and have the necessary public health licenses. Sanook even used the English word “discredit” transliterated into Thai in their headline. However, Chaiyaporn did say that he felt the economic impact on the business would only be temporary. Thaivisa notes that putting your head in a place normally reserved for feet in Thailand would shock Thais but is unlikely to have the same effect on people abroad.